A young female kung fu teacher, Rin, who must take over her grandfather's dojo. In order to prepare herself, she travels to China for 3,000 days of grueling Shaolin kung fu training. 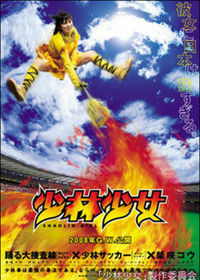 On her return to Japan, she works to rebuild the dojo and joins her university lacrosse club, putting her considerable physical prowess to work for the team.Shaolin Girl is a sequel to the 2001 Stephen Chow Chinese comedy Shaolin Soccer. The sequel is a Japanese production, with Stephen Chow working as a producer of the film.